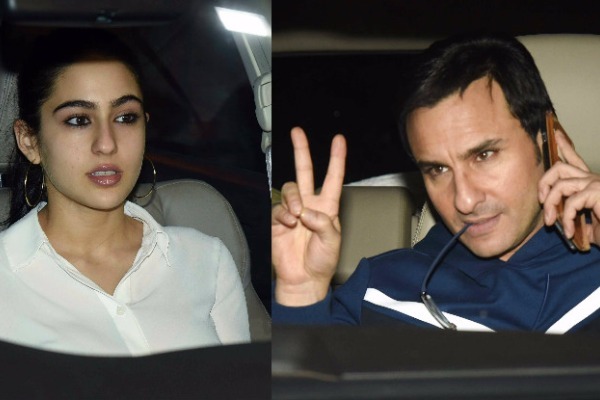 Is Daddy Saif Ali Khan Not Happy With Daughter Sara Ali Khan’s Debut Opposite Sushant Singh Rajput? Bollywood actor Saif Ali Khan’s daughter Sara Ali Khan, who is a graduate of Columbia University in New York, is all set for her big acting debut opposite Sushant Singh Rajput. The pretty girl is set to make her debut with ‘Kedarnath’, directed by Abhishek Kapoor, co-starring Sushant Singh. However, looks like Sara’s father Saif Ali Khan is not so cool about his daughter making her career in acting. The Rangoon actor is apparently unhappy that Sara has picked films over her alternate career. Also Read: Ex-Lovers Sushant Singh Rajput and Ankita Lokhande Meet Up At A Coffee Shop! However, he seemed to be a little skeptical about Sara’s acting career and even revealed that Sara always wanted to be an actor. “I remember years ago we’d gone for a stage show abroad and while I was on the stage with Salman and other actors, Sara was standing behind the stage curtain and looking at us. I knew then that she wanted this for herself. Being on stage and people shouting her name,” he added. Saif Ali Khan also confessed that he was not involved in Sara getting her first Bollywood project. “I am there if she needs to ask or talk to me about anything. I know what she is doing and we talk about films just like we do about everything else,” said Saif Ali Khan. In PICS: India’s Iron Man Milind Soman In Love Again And Is Dating A Girl Half His Age! Now we are confused if Saif is cool about his daughter’s acting career or no. However, his ex-wife Amrita Singh is quite supportive and in fact, was also a part of Sara’s first script reading session. Previous : In PICS: India’s Iron Man Milind Soman In Love Again And Is Dating A Girl Half His Age!